This shock-absorbing stabilized left arm for the Armor Man 2.0 attaches to the back of the Armor Man 2.0 vest. 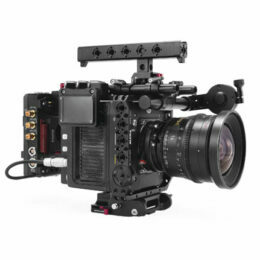 When engaged, the arm has two adjustable tension knobs to allow you to adjust for the weight of your gimbal/camera rig as well as your preferred operating style (whether you want the arms bowed out away from your body or tight and compact to your body). You can attach a variety of gimbal supports to the end of the arm to allow you to use the Armorman with any kind of 3-axis gimbal, whether a top bar-based gimbal, a ring-based gimbal, or even if you want to use the Nucleus-M handles on your gimbal. Each of these supports attach to the arm on a sliding dovetail-based system so that you can adjust them for maximum comfort based on your operating preferences.